LAS VEGAS NEVADA Ð USA 2001. 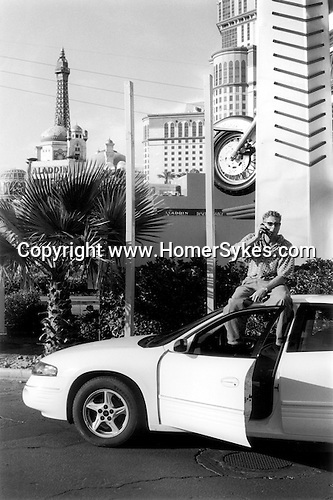 DOWN TOWN LAS VEGAS, A YOUNG MAN IN SUNGLASSES SITS ON THE ROOF OF HIS CAR SPEAKING INTO A MOBILE TELEPHONE. THE LAS VEGAS EIFFEL TOWER IS IN THE BACKGROUND.